Technically, Sue Huddy’s piece should have been Part 3; however, it reports things that happened after what I am reporting on, so I’ll keep that label! This post will report on Sessions 3 & 4, namely, Technology Advances and Perspectives. I opened Session 3 with a talk on ‘Virus-derived ssDNA vectors for the expression of foreign proteins in plants’, focusing mainly on geminiviruses (naturally). I wrote this a couple of years ago as a chapter for a book which seemed to not be forthcoming; however, I was assured during my talk by Yuri Gleba – the co-Editor with Kenneth Palmer of a “Current Topics in Microbiology and Immunology” issue on “Plant Viral Vectors” – that this offering is now in fact available, so here’s a link for anyone who wants to buy it. Plant viruses with ssRNA genomes provide a unique opportunity for generating expression vehicles for biopharming in plants, as constructs containing only the replication origin, with the replication-associated protein (Rep) gene provided in cis or in trans, can be replicationally amplified in vivo by several orders of magnitude, with significant accompanying increases in transcription and expression of gene(s) of interest. Appropriate replicating vectors or replicons may be derived from several different generic geminiviruses (family Geminiviridae) or nanoviruses (family Nanoviridae), for potential expression of a wide range of single or even multiple products in a wide range of plant families. The use of vacuum or other infiltration of whole plants by Agrobacterium tumefaciens suspensions has allowed the development of a set of expression vectors that rival the deconstructed RNA virus vectors in their yield and application, with some potential advantages over the latter that still need to be explored. 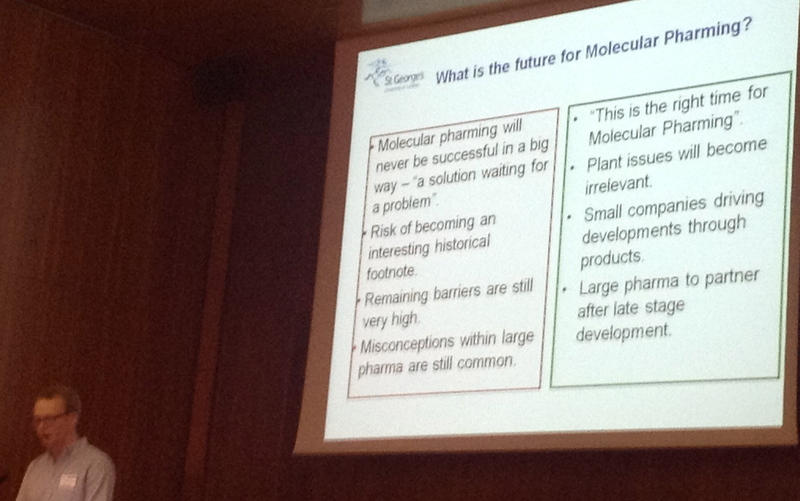 Several modern applications of ssDNA plant vectors and their future potential will be discussed. I noted that several firms are already using geminivirus-derived expression technology – like Kentucky Bioprocessing, who offer use of it as a service, and Medicago Inc, who use it in manufacturing vaccine products – and that it has considerable potential for improvement. There is also the possibility of using other ssDNA virus-derived vectors, including from bacteria. E.V. Sheshukova (N.I. Vavilov Institute of General Genetics RAS, Moscow) followed up with an account of how the use of antisense RNA to plant death factor (PDF) could modulate PDF level so as to avoid the necrotisation caused by rapid protein over-expression. Their group used a TMV-based vector to co-express an antisense with the gene of interest, and got 4-5-fold increase in protein expression, equivalent to using the silencing suppressor p19 from a tombusvirus. Diego Orzaez (IPMCP-CSIC, Valencia, Spain) spoke next, on the same technology I have previously described (with beautiful pictures from Diego) here: that is, the enabling of tools for multigene engineering of plants – and specifically in this case, the elegant use of superinfection exclusion phenomenon seen with RNA plant virus-derived vectors that are capable of movement, for the expression of polyclonal antibody mixtures in plant leaves. They had successfully shown expression of 300+ individual clones from a camel VHH clonal library derived against a mixture of 3 snake venoms, in a mosaic on a single leaf. This was seriously impressive for me: imagine, polyclonal “sera” from a leaf! Diego noted that the FDA allows the 2-animal rule for products like antivenin, and things used for biodefence: that is, an efficacy trial in an animal, followed by Phase 1 trial in humans (=safety). This could help expedite approval of such products. We discussed the paper previously blogged on from this group in Journal Club today, incidentally, to much appreciation of the truly excellent work, and the colour Figures. Thanks, Richard! Reza Saberianfar (Agriculture and Agri-Food Canada, Ontario) described their investigations of protein body biogenesis in N benthamiana. They had looked mainly at hydrophobin and elastin fusion proteins, in order to overcome the joint bottlenecks of inadequate accumulation, and difficulties in purification of recombinant proteins from plants. He noted that hydrophobin and elastin PBs were different sizes: they had used protoplasts of infiltrated leaves and confococal microscopy and Imaris software to find every PB in individual cells, to determine that shows hydrophobin-based PBs were 1-2 um, and ELP-based were 2-3 um in diameter, for the same amount of protein. PBs made from hydrophobin and ELP-linked proteins shared the same ER origin, but Zera-based PBs had a different origin and Zera fusions did not need a KDEL for ER retention. An interesting observation was that PBs could form in the ER in the absence of fusion tags if expression levels were high. One could also increase the expression of other proteins by coexpressing them with a fusion protein, as they get incorporated into PBs anyway – eg: EPO. 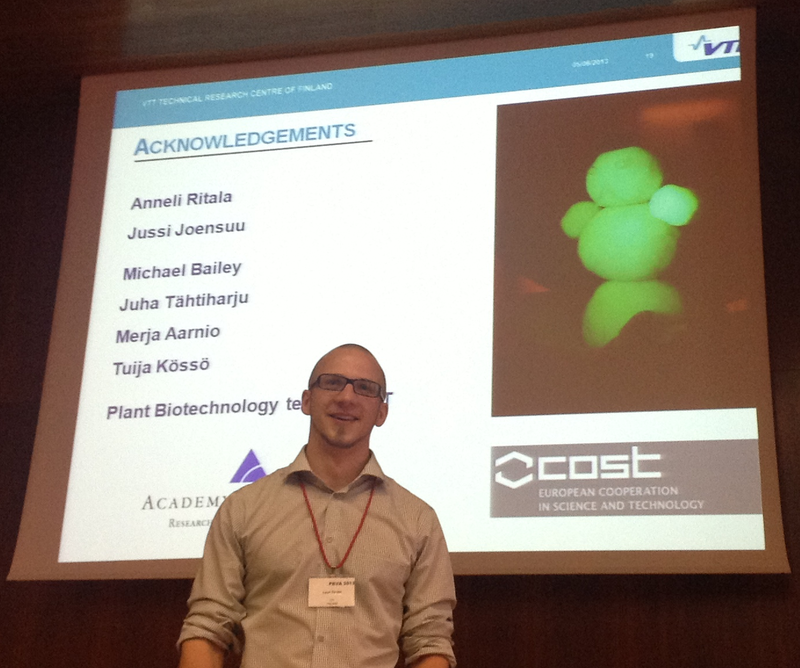 Lauri Reuter (VTT-Technical Research Centre, Finland) continued in the theme of fusion proteins with a talk on the production of hydrophobin fusions in tobacco BY-2 suspension cultured cells. It was interesting to hear that WAVE bioreactors did not work well because they did not shake fast enough, but that conventional steel bioreactors did – with capacities of 20 – 600 litre, and even up to 20 m3. The cells are apparently surprisingly tolerant to shear stresses, and yields of GFP::hydrophobin fusion from 600 litre reactors were as good or better as from a 50 ml shake flask – at 300 mg/litre. Purification was simple, in that reactors could be pumped out onto a filter, and the cell “cake” pressed dry – for subsequent lyophilisation and storage at room temperature, for example. French pressing of fresh cells was also an option. Hydrophobin fusions allowed aqueous 2-phase separations, for simple and rapid enrichment. Inclusion of a Tobacco etch virus self-cleaving motif allowed removal of the hydrophobin. The “Perspectives” Session was notable for two talks, and a proposal: the latter was by Julian Ma for a “Society for Molecular Farming”, which was well supported and will probably kick off sometime this year. 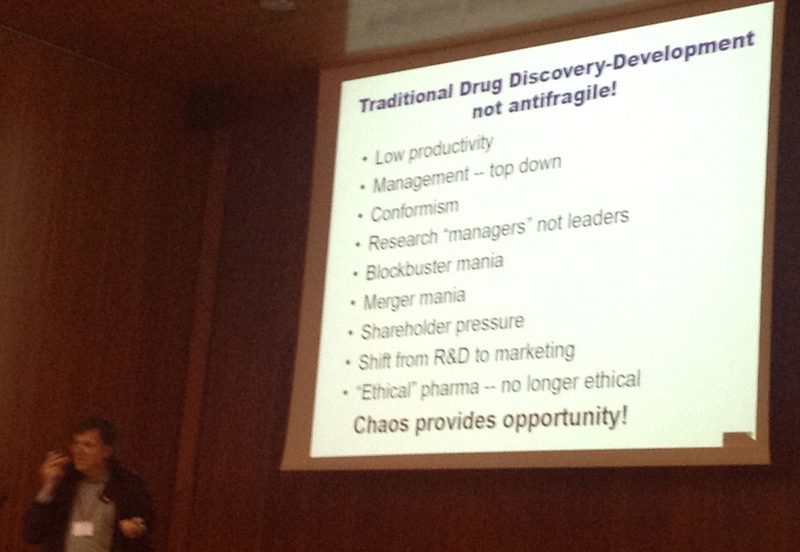 Jim Larrick (Panorama Research, Mountain View, California) gave a typically eclectic, wide-ranging and highly enthusiastic talk on ‘Anti-fragility: Big picture issues in pharmaceutical development’. He used the “Black Swan” analogy repeatedly to explain how the enterprise funding and pharma research sectors embodied fragile or anti-fragile thinking – with the observation that it was easier to resist black swans (eg: the unexpected) with a raft of small projects, than to have a few big ones. He also pointed out that the NIH liked big projects – and that a useful alternative name for them was “Not Invented Here”! Right up there with “Not Real Funding” as the alternative name for our National Research Foundation…. Matthew Paul (St. George’s University of London) presented a set of 15 case studies of commercial paths to introducing molecular farming, which was very interesting to us academic types. More interesting was the fact that while innovative and protectable technology and products were important to start-ups, the majority of successful ones had their basis in platform development – and the average time from platform to product identification was about five years. Venture capital firms were considered too greedy for early-stage start-ups, but their involvement later led to stability as their partnering was long term. Another interesting feature was that many of the successful ventures sold “side products”: for example, Ventria sold cytokines and cosmetic formulations, while KBP sold cell culture reagents. Several also licenced out technology platforms, but the revenue was not held to be so good. A good strategy to stay alive was “maximum income / minimum burn” – and he held up the example of Medicago in this regard. He noted that in the absence of major investment from Big Pharma, Phase 2 trial success was the driver for commercialisation. When University of Texas Medical Branch at Galveston researchers set out to study Crimean-Congo hemorrhagic fever virus, they faced a daunting challenge. The answer: step by painstaking step. Among other things, the new system will enable the researchers to study the virus’ transmission by a variety of tick species. On the list are North American ticks, to investigate the possibility that Crimean-Congo hemorrhagic fever virus, like West Nile virus, could be introduced into the United States. Interesting: because the virus is endemic here in South Africa, just a couple of hundred km away from urban Cape Town. More colloquially known as "Congo Fever" here, we even have isolation wards ready at local hospitals to cope with the rare human infections: rare, because the ticks (bont-legged, or Hyalomma spp.) have only a short window in their life cycle where they like animals our size. When they are smaller, they go for small animals, and when adult, they go for large ones – like ostriches, cattle, kudu, etc. In which they do NOT, incidentally, cause disease – so infections are often seen in abattoir workers, from handling viraemic but symptomless carcasses. I do like the last sentence above: "keeping the US safe from Congo fever!" More important but umentioned, is that the virus is ALSO endemic where the US military likes to go and adventrue: places like Afghanistan, Iraq, Central Asia…. Because vaccine deniers lack any scientific evidence supporting their unfounded belief system about immunizations, they tend to rely upon unscientific information like anecdotes, misinterpretation of data, or ignorant Italian provincial courts to make their case. It’s rather easy to debunk these claims, but because of the nature of the internet, old news is recycled as “brand new,” requiring a whole new round of blog posts to discredit the misinformation. It’s impossible to recall one single instance where a vaccine refuser made a statement about vaccines that was not, in fact, rather quickly debunked. Not one. Great article: pity about the originally misleading title, though, which I have fixed for this blog. TWO years ago a pair of scientists sparked fears of a devastating virus. Yoshihiro Kawaoka of the University of Wisconsin-Madison and Ron Fouchier of Erasmus Medical Centre, in Rotterdam, separately found ways to make a strain of bird flu called H5N1 more contagious. Critics fretted that terrorists might use this knowledge to cook up a biological weapon. American officials ordered that the papers be redacted. Further research was put on hold. But after much debate, the papers were published in full last year. And now, in a letter to Nature and Science published this week, Dr Kawaoka and Dr Fouchier propose that similar studies of H7N9, another strain of influenza now circulating in China, should be carried out. American health officials… explained how they would review studies that tried to enhance the transmissibility of H7N9. The process is similar to that for H5N1. It is unclear exactly how long such a review would take, however, and viruses may adapt more quickly than bureaucrats and academics. A really good piece from The Economist – as one should expect, I suppose! I DO like that last paragraph – because it encapsulates everything I think about the nonsense that surrounds discussions of this kind of work. Really, the viruses are out there doing what it is that viruses do, and influenza viruses in particular do really well: adapting and changing, by exploring sequence and recombination and reassortment space in order to maximise their own transmission and survival. And if that survival involves adapting to human-to-human transmission, then so be it: the virus doesn’t care. And we really, really need to be able to determine how close wild viruses are to doing just that, because the alternative could be The Big One. The HeLa cell line was established in 1951 from cervical cancer cells taken from a patient, Henrietta Lacks. This was the first successful attempt to immortalize human-derived cells in vitro1. The robust growth and unrestricted distribution of HeLa cells resulted in its broad adoption—both intentionally and through widespread cross-contamination2—and for the past 60 years it has served a role analogous to that of a model organism3. The cumulative impact of the HeLa cell line on research is demonstrated by its occurrence in more than 74,000 PubMed abstracts (approximately 0.3%). Haplotype resolution facilitated reconstruction of an amplified, highly rearranged region of chromosome 8q24.21 at which integration of the human papilloma virus type 18 (HPV-18) genome occurred and that is likely to be the event that initiated tumorigenesis. We combined these maps with RNA-seq6and ENCODE Project7 data sets to phase the HeLa epigenome. This revealed strong, haplotype-specific activation of the proto-oncogene MYC by the integrated HPV-18 genome approximately 500 kilobases upstream, and enabled global analyses of the relationship between gene dosage and expression. We have known for years that HeLa cells contain integrated HPV-18 genome(s) – now we know that they can be very probably causally linked to the cervical cancer that killed Ms Lacks, and led to her immortal cells becoming so much a part of modern molecular biology. This is a tour de force in modern biology, and shows that, even 62 years later, new findings are coming out of old material. Even if it is immortal – which poor Ms Lacks was not. Garlic production is severely affected by virus infection, causing a decrease in productivity and quality. There are no virus-free cultivars and garlic-infecting viruses are difficult to purify, which make specific antibody production very laborious. Since high quality antisera against plant viruses are important tools for serological detection, we have developed a method to express and purify full-length plant virus coat proteins using baculovirus expression system and insects as bioreactors. The expression of a plant virus full-length coat protein fused to the baculovirus Polyhedrin in recombinant baculovirus-infected insects was shown to produce high amounts of the recombinant protein which was easily purified and efficiently used to generate specific antibodies. Therefore, this strategy can potentially be used for the development of plant virus diagnostic kits for those viruses that are difficult to purify, are present in low titers or are present in mix infection in their plant hosts. I love the way plant virology / biotechnology now makes use of the whole spectrum of mol biol: this paper uses cDNA clones of an RNA plant virus, via E coli, to make recombinant baculoviruses, to express a fusion protein in insect cells – to make sera for detection of the plant virus by ELISA and other serological assays. I’m biased because my lab uses ALL of these techniques (and I would have made the protein via agroinfiltration in plants), but this sort of science has really come of age. One that I have lived through, incidentally, as cloning was VERY young when I started out – and ELISA had only just been invented. I also know Renato quite well – so parabens, meu amigo! The strategy will enable healthy molecules in human lung cells to latch on to these viruses and cut the bugs up before they have a chance to infect the human host. Excellent idea: engineer in sequences that allow naturally-occurring miRNA sequences in the human, but not the ferret lung, to snip the viral DNA so that it cannot cause a problem. HOWEVER: do you suppose they have considered what happens when the engineered influenza virus, were it to go wild, mutates so as to avoid getting the snip? A group of 22 prominent influenza researchers have today (August 7) published a letter in both Natureand Science, stressing the need for a new wave of controversial studies on the H7N9 bird flu virus—so-called “gain-of-function” experiments that deliberately engineer mutant viruses to identify mutations that would make naturally occurring strains more transmissible or virulent in mammals. This subtype of flu had no history of infecting humans until three cases were reported in China this March. Since then, H7N9 has infected at least 133 people and killed 43. Warmer summer weather and the recent closure of the country’s live bird markets have helped to contain the outbreak, but as colder months approach, researchers fear that the virus could re-emerge. Seriously, if work is not done on this rather nasty virus – especially in view of potential human-to-human transmission, recently noted in Virology News – in parallel with similar work on H5N1, the scientific community will be missing the opportinity to make real headway in understanding how it is that influenza A viruses become more transmissible and virulent in humans. Patenting viruses doesn’t restrict research–it gives an incentive to do more research. In June, the U.S. Supreme Court ruled that people can’t patent isolated human genes, which it considers a product of nature, but they can patent something exceptionally similar: cDNA, a synthesized copy from which someone has removed the noncoding parts. Given that fine line, it’s not entirely clear how the decision will play out in practice or how it will affect work on nonhuman genes. But it’s a hot area of debate. Earlier this year, Dutch scientists received a patent from their country on the newly discovered MERS virus that killed at least 30 people. The researchers had isolated the virus in their laboratory from a sample sent by a Saudi doctor. The Saudi Ministry of Health protested that the patent would restrict research and lead to more deaths; the World Health Organization (WHO) said it would investigate the legality and take action. But they’ve got it backward. Patents are one of the best tools for quickly fighting disease. Definitely! I hate to say it out loud, in this era of "openness", but if you DON’T patent things sometimes, you may well have messed up the use of it for ever – because no-one commercial will touch anything that isn’t protected / protectable. Which means that funky new vaccine you just published on without protecting it will be forever "an interesting paper", but never a product. The NIH labs, for example, patent everything novel that passes through – because then they have a say in how it is commercialised, and can stop it being blocked by some company that wants to keep its own proprietary product current for that much longer. Our lab has quite a big patent portfolio, for example: we have something like 14 patent families, and over 60 individual country patents, which gives us a reasonable stock-in-trade when it comes to licencing things to companies. It has also given us leverage in getting money to work on new / improved versions of vaccines, for example, which has helped keep the lab afloat for a goodly number of years now! We also negotiated rights to licencing / commercialisation for certain things, such as guarantees for low pricing for South Africa and Africa, keeping all rights for Africa and sharing rights elsewhere, and so on. So they can be a tool for good, as well as all the other things they are accused of being! Thanks, Arvind Varsani, for alerting me to this. Cervical cancer is caused by infection with human papillomaviruses (HPV) and is a global concern, particularly in developing countries, which have ~80% of the burden. HPV L1 virus-like particle (VLP) type–restricted vaccines prevent new infections and associated disease. However, their high cost has limited their application, and cytological screening programmes are still required to detect malignant lesions associated with the nonvaccine types. Thus, there is an urgent need for cheap second-generation HPV vaccines that protect against multiple types. The objective of this study was to express novel HPV-16 L1-based chimaeras, containing cross-protective epitopes from the L2 minor capsid protein, in tobacco plants. These L1/L2 chimaeras contained epitope sequences derived from HPV-16 L2 amino acid 108–120, 56–81 or 17–36 substituted into the C-terminal helix 4 (h4) region of L1 from amino acid 414. All chimaeras were expressed inNicotiana benthamiana via an Agrobacterium-mediated transient system and targeted to chloroplasts. The chimaeras were highly expressed with yields of ~1.2 g/kg plant tissue; however, they assembled differently, indicating that the length and nature of the L2 epitope affect VLP assembly. The chimaera containing L2 amino acids 108–120 was the most successful candidate vaccine. It assembled into small VLPs and elicited anti-L1 and anti-L2 responses in mice, and antisera neutralized homologous HPV-16 and heterologous HPV-52 pseudovirions. The other chimaeras predominantly assembled into capsomeres and other aggregates and elicited weaker humoral immune responses, demonstrating the importance of VLP assembly for the immunogenicity of candidate vaccines.